Intoduction MAHARAJA RANJIT SINGH has been described as Sher-e-Punjab, the Lion of Punjab. During his adolescence he killed barehanded a lion at Gujranwala, and the place till date is known as the Sheranwla Bagh or the garden of lion-hearted person, heroic warrior and the legendry ruler of Punjab. It would not be correct to call him the Maharaja of Punjab, as his empire extended not over the villages and towns of the state but his domain in reality was the hearts of the people, he ruled and loved. It would be more appropriate to call him the Maharaja of the Punjabis. He was in reality a symbol of the Punjabi culture and a typical representative of the Punjabi folk. "Ranjit Singh has been likened to Mehmet Ali, to Napoleon. Mr. Jacquemont terms him a Bonaparte in miniature. There are some points in which he resembles both; but estimating his character, with reference to his circumstances and position, he is perhaps, a more remarkable man than either". "He was the most extraordinary man of the age between Constantinople and Peking." Physically the Maharaja was not a tall person but due to his extraordinary achievements the occupies a unique place in the history of Punjab, thereby he becomes a stalwart figure, who raised his head with dignity and honour. 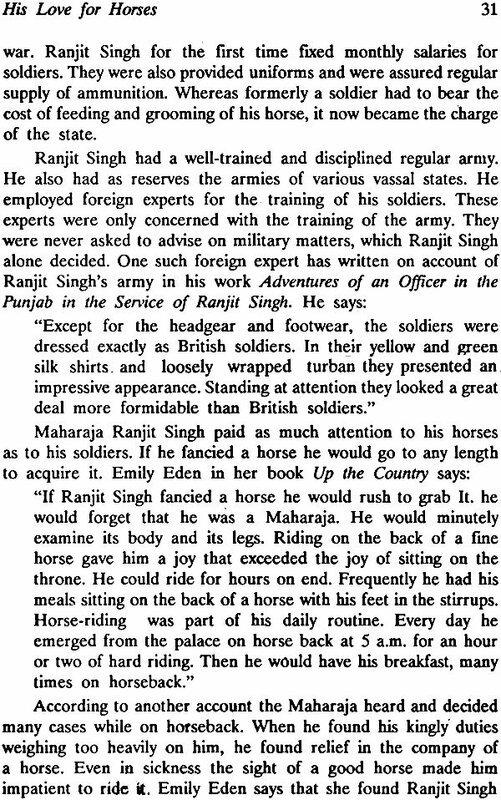 According to Emily Eden, the Sister of Lord Auckland who had accompanied her brother to India, Ranjit Singh did not appear to be very impressive, while sitting in his golden chair, but it was a sight to watch him riding his favourite stallion when he always appeared as the attractive and shrewd young warrior. Even in his court, he always relished to sit on the carpet, resting his back on a velvet cushion, surrounded by his people, courtiers and advisors. Though this style of functioning was rather ordinary and tended to depict him as an ordinary person instead of the king, but he liked it and always behaved like one of them. This perhaps was the secret of his popularity. He never considered himself different from his people even when he was sitting among his ministers, nobles, advisors or the officials he would cut jokes and share his heartfelt sentiment with them. During his rule, the people of the Punjab entered upon a period of internal peace, prosperity which they had not enjoyed for several generations. "We understand that your Maharaja has one eye only. Which one of his eyes is missing?". "But Why? Don't you ever see him?" "His remaining eye is very large and there is a fire and brilliancy about it when he becomes animated, which at once discovers the energetic mind and discrinating character of its owner. His smile is pleasing and his manner of address easy and unembarrassed on all occasions. He never appears at a loss for words to express his ideas which are quickly formed on any subject." "According to all English accounts,' Ranjit Singh's Court excelled in the world; as the court with the finest looking and best dressed person." "Ranjit Singh cannot fail to strike every one as that of a very extraordinary man.....The more I see of him, the more he strikes me as an extraordinary man." Those were the times, when the.Rajas and the Maharajas wore the Kamdar Zari clothes, studded with diamonds and pearls in golden lace and silken thread. But Hugel observes, he never saw him wear any embroidery, brocade or rich ornaments of any sort. The bracelet studded with 'Kohinoor' was worn by him only on special occasions. After he was free from the exacting demands of the state affairs, he liked to participate in the games and enjoyed fun and frolic. Hunting was his favourite occupation. The area between the rivers Satlej and Ravi was reserved for this purpose. The Maharaja would set out on hunting sprees accompanied by cavaliers, body-guards and soldiers. Usually the game started in the afternoon. The Maharaja was also accompanied by a team of trained hounds. Falcons were also used to chase and scare away the small animals like rabbits and birds. In the first instance they would set the falcon after the prey. The falcon would tire out the animal with constant chase and then pounce upon it. Sometimes the animal was captured after it had been injured by the powerful claws and the sharp merciless beak of the falcon. Then the hounds would take over. Ranjit Singh liked to fight the lions and tigers, with his sword and shield. The guns were not used for this purpose, whenever a tiger was taken by any of his men, he would reward him generously and praise him publicly. "His name is still a household word in the province. His portrait is still preserved in castle and in cottage. It is a favourite subject with the ivory painters of Amritsar and Delhi. Ranjit Singh still lives, large as life, in the imagination of the people. He does so, not only where the Sikhs now live, but also where they lived before; for, the Muslim village-folks shared him as a legendary figure with the Sikhs and they have not let him depart with the latter. Ranjit Singh's popular image is that of a kindly patriarch rather than that of a conquering hero or a mighty monarch. He was all there, but his humanity has outlived his splendour and power." "Maharaja Ranjit Singh succeeded by personal valour and fair treatment in welding desperate elements into a well-knit kingdom which maintained its integrity and independence against difficult odds. At a time like the present, when national integration is receiving so much attention, we should remind ourselves of the policies and principles which this great leader followed in instilling a sense of unity among' his people irrespective of their differences in religion, custom and tradition. His example should inspire the present generation." "Great personalities are the most potent agencies of national education. Maharaja Ranjit Singh was such a personality for India-one of the most outstanding ones during the 19th century. His force of character, his shrewdness, his statesmanship, his heroic courage, his large hearted tolerance, his secular impar- tiality and benevolence, stand out against the dismal background of our national decline. They stand out to sustain us in the formative years of our young national state." Last but not the least, reference may be made to the observation of Smt. Indira Gandhi, the late Prime Minister of India, who during the 2nd Centenary celebrations of Maharaja Ranjit Singh, had sent the following message to the Government of Punjab, which has been included in the commemoration volume. "Maharaja Ranjit Singh is one of the outstanding men that our land has produced. Every school child knows him as the Lion " of Punjab. His brilliance as a general and his statesmanship as a ruler have become household words ....... I hope that the people of Punjab and the country at large will imbibe his message of unity and tolerance, courage and steadfastness." In the present period of turbulance, national and emotional integration has become the need of the hour that is why the message of Ranjit Singh seems to be more relevant to-day as compared to his period. He had established his government on secular principles, where Hindus, Sikhs, Muslims, Christians and others were equal partners of progress .. He offered equal opportunity to all to serve without any difference of caste, creed and religion. Temples, mosques, and other places of worship were equally revered by him. He offered his royal patronage to the observance of festivals of all communities at the national level. He was much above the bigotry and treated each community with equal benevolence and generosity. Unity, equality and fraternity were the basic principles of his rule. The aim of producing the present monograph is to present these nobles ideals of Ranjit Singh to our present generation, which would also continue to serve as the guiding stars, in the times to come.